Hope everyone had a great weekend! This week started off nice here!! 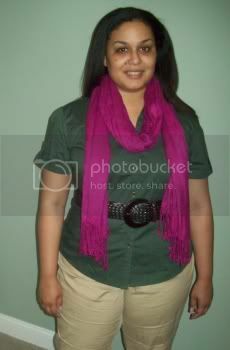 LOVE that scarf - beautiful color!! Love the pink and green! I love this color combo! And the sleeves of your shirt. I love sleeves rolled like that, but I feel awkward in collared shirts so I rarely get to wear stuff like that myself!